Jasper really is brilliant. He learned his name in about a day, and it took three runs of holding a treat over his head until he sat while saying “Sit” to teach him to sit on command. Last weekend, we went for a nice long snowshoe through the woods and he came along off-leash. We’d had him one week at that point, and he stuck with us faithfully, clearly having a lovely time. When we returned and got to the end of the road our cottage is on, he then started trotting ahead. He stayed politely on the side of the road, turned into our driveway and was waiting at the door when we got there. See – brilliant! But only yesterday did I realize just how brilliant he is, when J came home and told me that a co-worker of his was telling him about her Bernese Mountain dog. These are gorgeous dogs and had been on my list of dogs I like, but I’m sure glad we didn’t get one, because this co-worker told J that they have to give this dog at least an hour’s walk, preferably two, every single day and if they don’t, the dog doesn’t sleep at night. It keeps them up. Also, he hates walking in the cold. He goes out, pees at the end of the driveway, then bolts for the house. In milder winter weather he’s fine, but refuses to walk in the really cold stuff, and still sleeps all night and more. Brilliant. 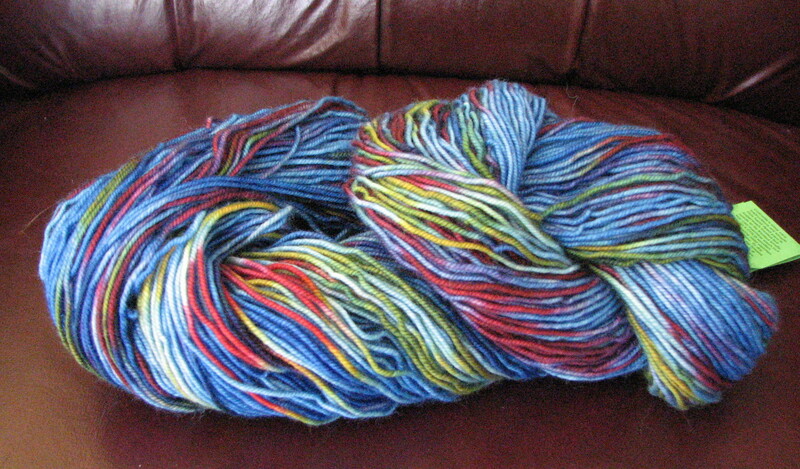 I’ve been reading the Yarn Harlot‘s books. My mother lent me them and I’ve been loving them. She writes knitting humour. Those who don’t knit probably can’t imagine knitting being funny, but it is, or at least, she is. She also fits in a fair amount of practical information. She also loves socks. I don’t really knit socks. I have knit 2 pairs – one for my brother and a matching pair for my niece several Christmases ago. I liked it, but there were just so many other things to knit that I’ve never done more. That, and I used to think wool was itchy so I saw no point in knitting myself any socks. Last winter, I had a wool sock epiphany, thanks to a friend who lent me a pair of her’s in a moment of desperation. The socks were warm and soft. I always have cold feet. Actually, I always had cold feet. Now I have wool socks. No more crappy, damp cotton socks for me. Wool socks aren’t cheap, but they are worth it. Anyway, I finally realized, thanks to the Yarn Harlot, that I can combine my love of warm socks with my love of knitting. I actually didn’t know that there exists yarn intended especially for socks. How convenient! I don’t have to buy wool socks, I can make them! Inspired, I popped out to the knitting store yesterday and was shown an entire aisle of sock yarn. Lovely, soft, colourful. And in some cases, pretty darn cheap. Cheaper than buying pre-made socks. I was restrained and only bought enough for two pairs – one a remarkably inexpensive alpaca in purply-blue, and one an expensive merino that, while expensive, wasn’t much more expensive than the actual socks would be. I took a picture, but it doesn’t completely do the wool justice. The colour looks a bit washed out here, but you get the idea. You’ve got to watch that — I have two unfinished sweaters at present (one just needs the bands, for goodness sake) and just bought a pattern for another one. Yep, brilliant dog. *Your* dog, I do believe. You’re in love! Put down the sock needle!!! Tsk.